Here we report the 8 Mb high quality draft genome of Streptomyces sp. strain AW19M42, together with specific properties of the organism and the generation, annotation and analysis of its genome sequence. The genome encodes 7,727 putative open reading frames, of which 6,400 could be assigned with COG categories. Also, 62 tRNA genes and 8 rRNA operons were identified. The genome harbors several gene clusters involved in the production of secondary metabolites. Functional screening of the isolate was positive for several enzymatic activities, and some candidate genes coding for those activities are listed in this report. We find that this isolate shows biotechnological potential and is an interesting target for bioprospecting. The filamentous and Gram-positive genus Streptomyces, belonging to the phylum Actinobacteria , are attractive organisms for bioprospecting being the largest antibiotic-producing genus discovered in the microbial world so far . These species have also been exploited for heterologous expression of a variety of secondary metabolites . Additionally, these species harbor genes coding for enzymes that can be applicable in industry and biotechnology [4,5]. Since the first, complete Streptomyces genome was published , a number of strains isolated from terrestrial environments have been reported [7–11]. Genomic investigations on Streptomyces from marine sources have, however, just recently begun [12–16]. Here, we present the draft genome sequence of Streptomyces sp. strain AW19M42 isolated from a marine source, together with the description of genome properties and annotation. Results from functional enzyme screening of the bacterium are also reported. The Streptomyces sp. strain AW19M42 was identified in a biota sample collected from the internal organs of a sea squirt (class Ascidiacea, subphylum Tunicate, phylum Chordata). The tunicate was isolated using an Agassiz trawl at a depth of 77m in Hellmofjorden, in the sub-Arctic region of Norway (Table 1). The trawling was done during a research cruise with R/V Jan Mayen in April 2010. The bacterium was isolated during four weeks of incubation at 4–15°C on humic acid containing agar media that is selective for growth of actinomycetes [29,30]. For isolation and nucleic acid extraction the bacterium was cultivated in autoclaved media containing 0.1% (w/v) malt extract, 0.1% (v/v) glycerol, 0.1% (w/v) peptone, 0.1% (w/v) yeast extract, 2% (w/v) agar in 50% (v/v) natural sea water and 50% (v/v) distilled water, pH 8.2 . The gene encoding16S rRNA was amplified by using two universal primers, 27F (5′-AGAGTTTGATCCTGGCTCAG) and 1492R (5′-GGTTACCTTGTTACGACTT) , in a standard Taq polymerase driven PCR (VWR) on crude genomic DNA prepared by using InstaGene Matrix (BioRad). Following PCR purification by PureLink PCR Purification (Invitrogen), sequencing was carried out with the BigDye terminator kit version 3.1 (Applied Biosystems) and a universal 515F primer (5′-GTGCCAGCMGCCGCGGTAA) . Using the 16S rRNA sequence data in a homology search by BLAST  indicated that the isolate belonged to the Streptomyces genus, among the Streptomycetaceae family of Actinobacteria. A phylogenetic tree was reconstructed from the 16S rRNA gene sequence together with other Streptomyces homologues (Figure 1) using the MEGA 5.10 software suit . The evolutionary history was inferred using the UPGMA method  and the evolutionary distances were computed using the Maximum Composite Likelihood method . The phylogenetic analysis confirmed that the isolate AW19M42 belongs to the genus Streptomyces. The closest neighbor with a reported, complete genome sequence is Streptomyces griseus subsp. griseus , however, the phylogenetic tree indicates that the Streptomyces sp. strain AW19M42 isolate belongs to a closely related but separate clade. Draft genomes have not been reported for this clade previously. Phylogenetic tree indicating the phylogenetic relationship of Streptomyces sp. strain AW19M42 relative to other Streptomyces species. The phylogenetic tree was made by comparing the 16S rDNA sequence of the Streptomyces sp. strain AW19M42 to the closest related sequences from both validated type strains and unidentified isolates. S. venezuelea is used as outgroup. All positions containing gaps and missing data were eliminated. There were a total of 1,389 positions in the final dataset. The bar shows the number of base substitutions per site. The organism was selected for genome sequencing on the basis of its phylogenetic position. The genome project is part of a Norwegian bioprospecting project called Molecules for the Future (MARZymes) which aims to search Arctic and sub-Arctic regions for marine bacterial isolates that might serve as producers of novel secondary metabolites and enzymes. High quality genomic DNA for sequencing was isolated with the GenElute Bacterial Genomic DNA Kit (Sigma) according to the protocol for extraction of nucleic acids from gram positive bacteria. A 700 bp paired-end library was prepared and sequenced using the HiSeq 2000 (Illumina) paired-end technology (Table 2). This generated 13.94 million paired-end reads that were assembled into 670 contigs larger than 500 bp using the CLC Genomics Workbench 5.0 software package . Gene prediction was performed using Glimmer 3  and gene functions were annotated using an in-house genome annotation pipeline. The total size of the genome is 8,008,851 bp and has a GC content of 70.57% (Table 3), similar to that of other sequenced Streptomyces isolates. A total of 7,727 coding DNA sequences (CDSs) were predicted (Table 3). Of these, 6,400 could be assigned to a COG number (Table 4). In addition, 62 tRNAs and 8 copies of the rRNA operons were identified. All putative protein coding sequences were assigned KEGG orthology , and mapped onto pathways using the KEGG Automatic Annotation Server (KAAS) server . The analysis revealed that Streptomyces sp. strain AW19M42 harbors several genes related to biosynthesis of secondary metabolites. We have identified genes that map to the streptomycin biosynthesis pathway (glucose-1-phosphate thymidylyltransferase (EC 2.7.7.24), dTDP-glucose 4,6-dehydratase (EC 4.2.1.46) and dTDP-4-dehydrorhamnose reductase (EC 1.1.1.133)). Also, several genes map to the pathways for biosynthesis of siderophore group nonribosomal peptides, biosynthesis of type II polyketide product pathway and polyketide sugar unit biosynthesis. Interestingly, two clusters, comprising five genes, both mapped to the biosynthesis of type II polyketide backbone pathway. These genes clusters comprise genes STREP_3146-3150 and STREP_4370-4374. This suite of genes may contribute to a distinct profile of secondary metabolites production. 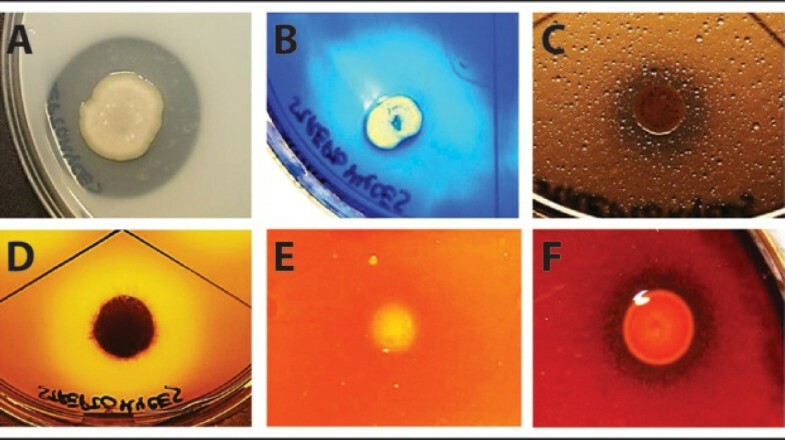 The isolate was successfully screened for lipase, caseinase, gelatinase, chitinase, amylase and DNase activities (Figure 2), by using marine broth (Difco) agar plates incubated at 20°C [41–46]. The plates were supplemented with 1% (v/v) tributyrin, 1% (w/v) skim milk, 0.4% (w/v) gelatin, 0.5% (w/v) chitin or 2% (w/v) starch, respectively (all substrates from Sigma), whereas DNase test agar (Merck) was supplemented with 0.3M NaCl, representing sea water salt concentration, before screening for DNase activity. Putative genes coding for these activities were identified in the genome based on annotation or by homology search (Table 5). Degradation halos around colonies of Streptomyces sp. AW19M42 growing on agar plates supplemented with A, skim milk, B, gelatin, C, tributyrin, D, DNA, E, chitin and F, starch. Candidate genes coding for putative lipase, caseinase, gelatinase and DNase activities identified in Streptomyces sp. strain AW19M42 draft genome. The 8 Mb draft genome belonging to Streptomyces sp. strain AW19M42, originally isolated from a marine sea squirt in the sub-Arctic region of Norway has been deposited at ENA/DDBJ/GenBank under accession number CBRG000000000. The isolate was successfully screened for several enzymatic activities that are applicable in biotechnology and candidate genes coding for the enzyme activities were identified in the genome. Streptomyces sp. strain AW19M42 will serve as a source of functional enzymes and other bioactive chemicals in future bioprospecting projects. This work was supported by the Research Council of Norway (Grant no. 192123). We would like to acknowledge Kristin E. Hansen and Seila Pandur for technical assistance during bacterial isolation and nucleic acid extraction. The sequencing service was provided by the Norwegian Sequencing Centre (www.sequencing.uio.no), a national technology platform hosted by the University of Oslo and supported by the “Functional Genomics” and “Infrastructure” programs of the Research Council of Norway and the Southeastern Regional Health Authorities. Genomics Workbench CLC. 5.0 software package. http://www.clcbio.com.